Every generation has someone that makes an impact and leaves a legacy to be admired. Heroes that work to make a difference in their communities and beyond. Many know his name and his work ethic, but may not be aware of his foundation and true life passion. 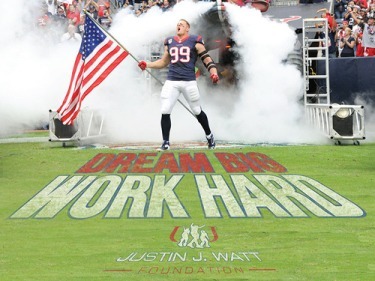 Tune in this Thursday from 10am-11am (CST) on Business 1110am KTEK (Streaming live at www.business1110KTEK.com) for The Unleashed Radio Hour where our guest, Houston Coordinator Karen Edelman, will join us and talk about the mission and outreach efforts of the JJ Watt Foundation. You do not want to miss this show! Grab your popcorn, some Sno-Caps perhaps? This entry was posted in Community, Outreach, Talk Radio, Youth and tagged Community, DBWH, JJ Watt, JJ Watt Foundation, Youth. Bookmark the permalink.